The blending of old school comic book pages and new world CG is a standout in this innovative animated feature film. The characters look real-ish, their voices are clear as a bell, yet the footage inserts headlines just like you’d see in a comic book: blaring black type in yellow boxes. Screens can be full-frame or divided. Gigantic expressive words like “Wooooo” pop up. The clever blend of classic hand-drawn animation with the latest technology takes animation into a new age. Everyone from the visual effects, art and production management teams should take a bow. With special praise for art directors Dean Gordon and Patrick O’Keefe and production designer Justin Thompson (“Cloudy with a Chance of Meatballs”). Also, Mile’s cool red/blue Spider-Man uniform looks like it’s part of a collection from a 22nd century Nike sports clothing line. Miles (Shameik Moore, “Dope”) is an inner-city kid facing a life crisis. He’s going to a private school in Manhattan, away from his friends in Brooklyn. The parental guidance that steers his child development comes from his loving African American father Jefferson Davis (Brian Tyree Henry, “If Beale Street Could Talk”), a cop, and his nurturing Puerto Rican mom Rio Morales (Luna Lauren Velez, “Dexter”), a nurse. When Miles feels he can’t talk to his parents about his apprehensions, the fledgling artist seeks council from his Uncle Aaron (Mahershala Ali), a graffiti artist with a checkered past. 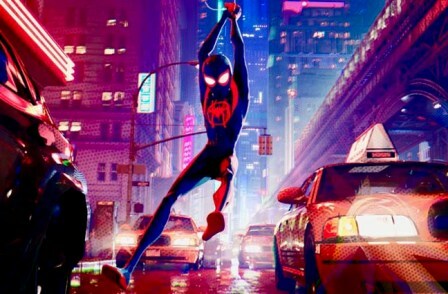 Reinforcements are brought in—Spider-People from another dimension—and the cast of actors who portray those fellow superheroes is impressive: Hailee Steinfeld (“True Grit”), Jake Johnson (“Tag”), comic/writer John Mulaney (“Saturday Night Live”), Kimiko Glenn (Liza on Demand TV series) and Nicolas Cage. Beside the stunning visuals and fun voices, the film’s other strength is its ultra-hip musical soundtrack. The basic score was created by Daniel Pemberton (“Ocean’s Eight,” “Molly’s Game”) and it’s the glue. The bricks are a playlist of the hippest music on a soundtrack since Black Panther. The songs to remember are “Sunflower,” sung by Post-Malone & Swae Lee and the very aggressive and growling song “What’s Up Danger,” performed by Blackway & Black Cavier. 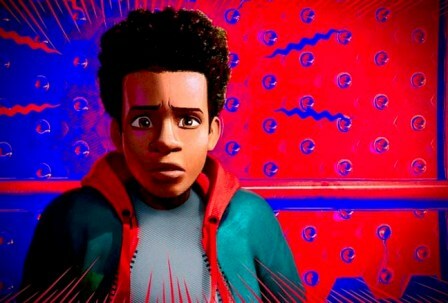 Directors Peter Ramsey (“Rise of the Guardians”), Bob Persichetti and Rodney Rothman have created a very modern, fresh and timely version of a classic franchise in need of an overhaul. One of their advantages was that they had limitless creative freedom: Live-action versions of Spider-Man, by their nature, have constraints. For the most part, the filmmakers have achieved their goals and will likely inspire animators on into the future. If this lively montage of superhero angst had one flaw, it’s that sometimes the weight of the heavy, complex, multi-faceted visuals stymies momentum.